My friend bought it for me for my birthday one year and I totally recommend it. The recipes are gorgeously shot and the book is beautifully designed and astoundingly comprehensive. 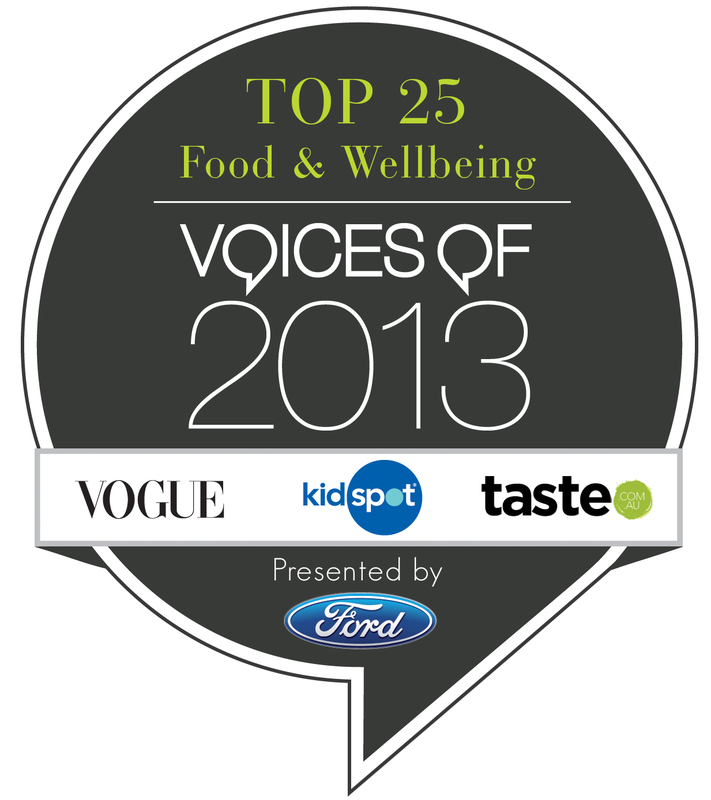 Do you like Bourke St Bakery’s pork & fennel sausage rolls? The recipe is in there. Ginger brulée tarts? Yup. In there too. Pretty much everything I can think of is in there. It’s quite generous of them to be so open about their recipes. THE ONLY PROBLEM IS… as a baking novice, I find the recipes pretty daunting! I can see why giving away all their secret recipes does their bakeries no harm – I don’t know about you, but after learning how much effort and hours it takes to bake a humble loaf of soy & linseed sourdough bread, PHEW… I am definitely in need of some sort of delicious chocolate tart thingy to recover (and yes please… I’d like someone else to bake it for me). The recipes sound so good though – and the photos so tempting. So, I will confess to you now – I’ve taken to cutting corners here or there. So here is my hodgepodge version of Bourke St Bakery’s Potato Schiacciata, which I made to take to a friend’s housewarming! The topping is adapted from the Bourke St Bakery recipe, but to make things easier for me – I reused the Brasserie Bread recipe for Schiacciata con L’uva that I posted about previously on my blog. If you’ve never made bread at home before – the Brasserie Bread Schiacciata dough is a dead easy beginner’s recipe – and I’ve posted a lot of tips if you’re just starting out! 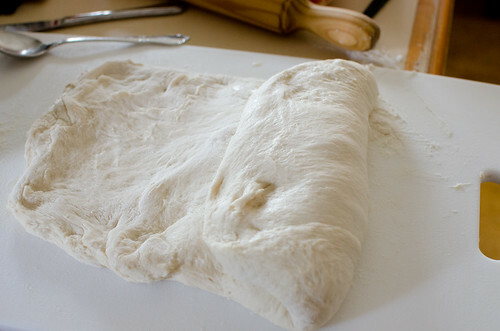 Start by following the recipe for Schiacciata dough. Once your dough is in the fridge to rise – you can start prepping the toppings. Slice the onions into rings. Heat the olive oil in a pan, and cook the onions on a low heat. Add the tablespoon of balsamic vinegar, and a pinch of salt to taste. The onions should cook slowly for at least an hour – stir occasionally so they don’t burn or stick to your pan. 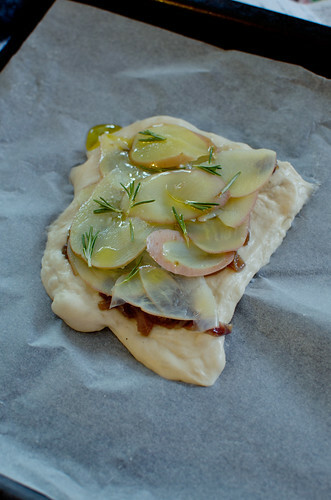 The onions should go translucent, reduce in size dramatically, slowly caramelise and soften. Slice the potato thinly using a mandolin (of if you are very patient – a sharp knife!) – to about a 2mm thickness. Give the slices a bit of a rinse. Then place them into another saucepan and cover with water, add a bit of salt – and simmer for 3-5 minutes, or until they are almost soft. Once they’re done, place the slices into a bowl full of cold water until you’re ready to use them. By now your dough should have finished rising. 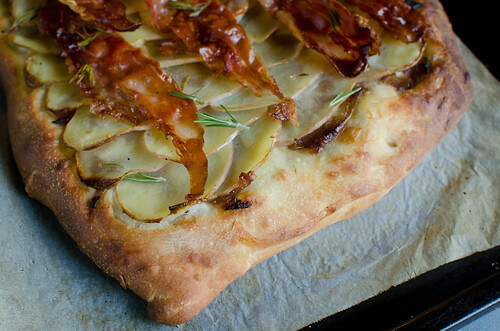 Take your dough out of the fridge – and gently turn it out onto a tray lined with baking paper. 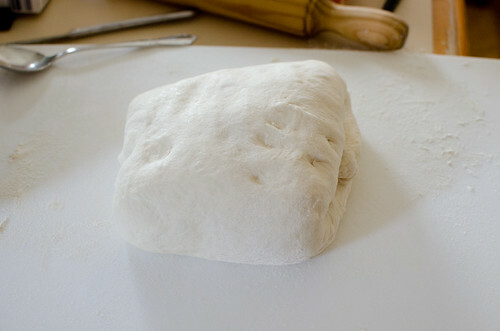 Knock the dough back by flattening it gently to let the air escape. 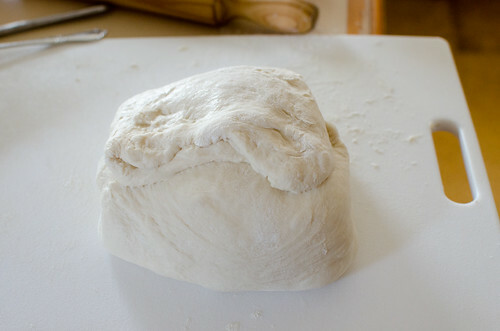 Pick up the right edge of your dough, and fold the dough into thirds so that the seams overlap (see photos above). Repeat with the top and bottom edges. 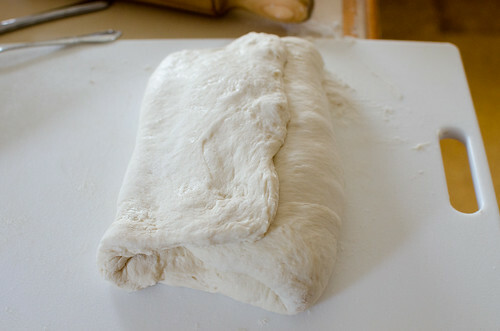 Flip your dough over so the seams are on the bottom. This creates layers in your bread and gives it a bit of structure and strength. Press the dough down flat with your fingers to make it about 1cm thick (or you can gently use an oiled rolling pin if you like). 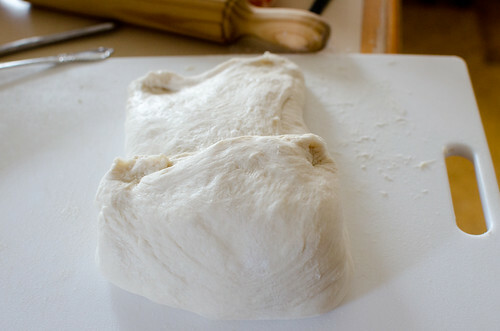 Let your dough rest and recover for 10 minutes. 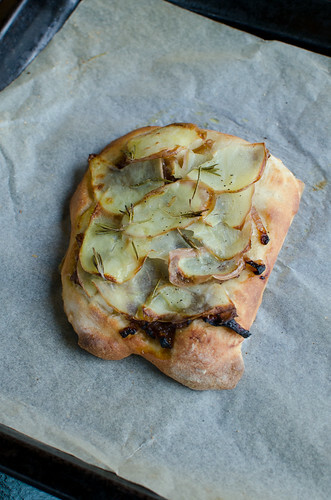 Spread your caramelised onions onto your dough (leaving a border around the edge). 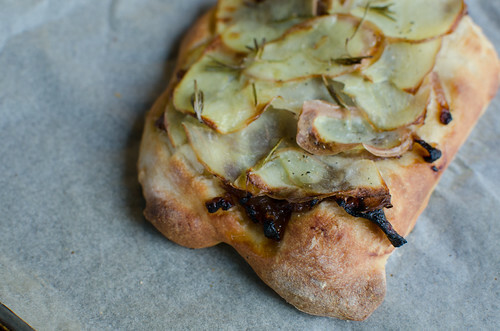 Now place your potato slices onto your bread in a scale pattern, so they overlap each other a little bit. 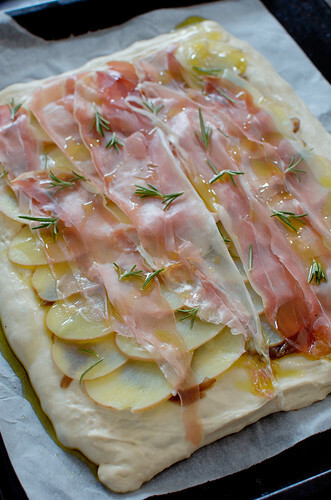 Add the prosciutto slices (optional) and scatter with some rosemary sprigs, season with a bit of salt & pepper and drizzle with a bit of olive oil. 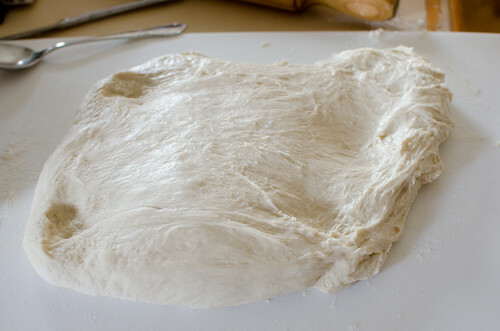 Let your dough rest and recover for another 10 minutes. Sadly having a case of the midnight munchies at the moment. That looks so so good. hello melly! 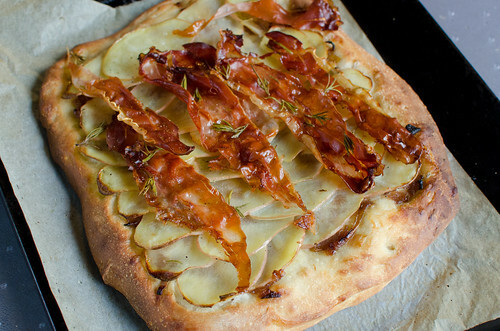 YES i plan to make this…i will let you know how i go! YUM!!! As a side or even on its own. I need to buy that BSB Book. NOW!! Well, this is just delicious…. I am going to try this for sure.